But what about offering people in need access to fresh foods at affordable prices? 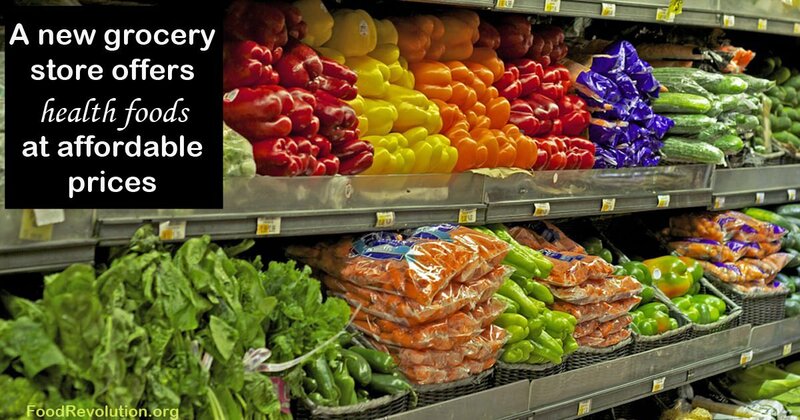 That is exactly what a new grocery store concept called The Daily Table aims to do. You won’t find items like chips and sodas on their shelves. Instead, they secure what they call “wholesome, nutritious food” that would ordinarily end up in the landfill — and sell it for low prices. Trained chefs also prepare “grab-n-go” options daily, like entrees, sandwiches, and soups, so people can quickly and easily get something healthy to eat if they don’t have time to cook. Entrees start at $1.79. Side dishes range from 50 cents to a dollar. And you can get 8-ounces of frozen okra or bananas for 29 cents. Could this be a solution that bridges food waste and hunger and helps improve the way the food system works? Americans waste a lot of food — about 40% of everything we grow goes uneaten. And almost all food waste ends up in the landfill, where it rots and becomes a significant source of methane — a potent greenhouse gas with 21 times the global warming potential of carbon dioxide. The food sold at The Daily Table is purchased at drastically reduced prices or donated from a network of growers, supermarkets, manufacturers, and other suppliers who would otherwise throw these foods away. This way food waste is reduced, and the damage to our environment is lessened. Almost 50 million Americans — including 15 million children — are considered food insecure, meaning they lack access to enough food for an active, healthy lifestyle. And worldwide, more than 750 million people are hungry. So having a place to go for a variety of fresher and healthier foods could begin to change things, at least for some communities. The Daily Table is an organization that says it has the health of its customers in mind. They have a nutrition task force, with members coming from the Harvard School of Public Health, the Boston Organization of Nutritionists, and more, that helped set their guidelines for salt, sugar, fat, fiber, and other factors. And while this statement might not be literally true, these grocery stores could offer a big improvement over what the people in lower income communities normally eat: unhealthy fast food and processed junk food — if they can afford to eat at all. The creator of The Daily Table and former Trader Joe’s president, Doug Rauch, believes his concept can improve health outcomes for many people. The Daily Table aims to make fresher, healthier foods available in communities where it is needed, at low prices, using food that would normally be wasted. The first store opened in Boston on June 4, 2015. Other stores locations could open in the future in other cities across the United States, including Los Angeles, New York, Detroit, San Francisco, and Baton Rouge. Overall, the more people in need who have access to fresh, unprocessed, affordable foods, the better off they will be, as will their country, and our world. What do you think about The Daily Table concept? Would you support one in your community or another community in need? Share your comments below!